For the ACCME, the Program and Activity Reporting System (PARS) is a reservoir of valuable data which provides the most accurate portrait of your association’s ability to meet the high standards required of CME providers. If you’re a CE coordinator, however, ACCME PARS submissions can be one of the most challenging (and often tedious) elements of CME management. In this post, we’ll look at three important facts about PARS every CE coordinator should know, and discover ways to make the use of PARS a less daunting experience for CME providers. For many CE coordinators, the most difficult aspect of using PARS isn’t navigating the platform, but the process of developing an approach to data management that simplifies the submission process. CE coordinators must collect, verify, and analyze a wide range of program data, taking care to present clear evidence of consistent compliance with ACCME directives throughout the entire organization. The CE coordinator must then transform this hard data into a coherent, engaging narrative—one that communicates the effect of their association’s unique approach to CME on the overall quality of healthcare. It’s a tall order, and with so much riding on the ACCME’s interpretation of PARS data, it’s critical your organization streamline the PARS data submission process. Now let’s take a quick look at a few PARS basics. 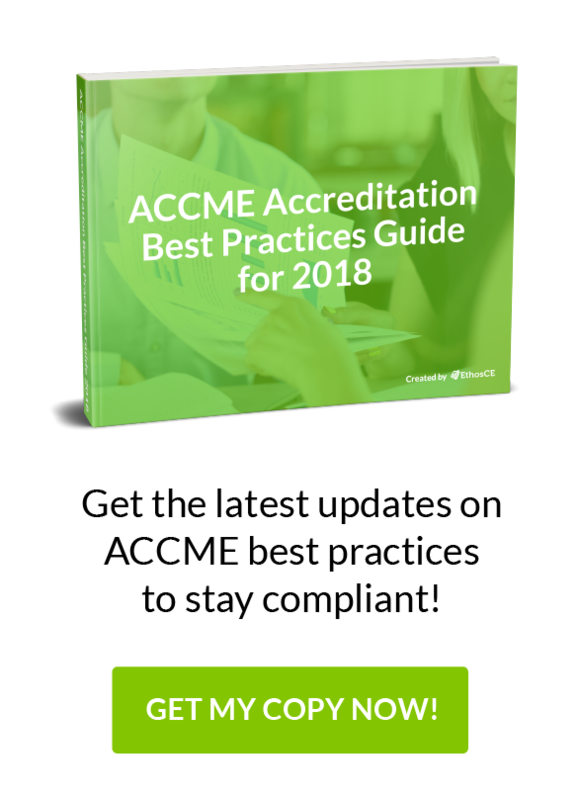 The ACCME requires every CME provider to maintain comprehensive records of program operations—from curriculum development practices to the monitoring of commercial interests to activities participation rates— throughout the term of accreditation. The ACCME uses information submitted through PARS to confirm the Self-Study Report narrative and projected learner outcomes are data-driven, rather than anecdotal. When reviewing your PARS submissions, the ACCME examines patterns of consistency in program compliance, the quality of critical data, and any available evidence that quality assurance practices are efficient and scalable. What ACCME is looking for is a clear depiction of your association’s ability to maintain an agile CME structure and that they can sustain compliance as learners’ needs change, and administrative challenges emerge. Designed to change (Competence, Performance or Patient Outcomes)? Changes in (Competence, Performance or Patient Outcomes) evaluated? You must submit all program and activity data for the completed Reporting Year and complete the Attestation by the last business day of the following March to allow for the calculation of the Annual Report data. Data entry for the 2017 reporting year for ACCME-accredited providers must be completed April 2, 2018. Providers accredited by a state medical society may be required to complete their 2017 year-end reporting earlier and should verify dates with the accreditor. ACCME accredited providers may use PARS to submit information on the Extended-Release and Long-Acting Opioid Analgesics REMS CME activities they provide. Each year, accredited providers must meet year-end reporting requirements. Failure to submit the year-end report through PARS by the due date may result in an accredited providers status being changed to Probation. Providers still noncompliant after the ACCME Board of Directors meeting that follows the deadline may have their accreditation status changed to Non-accreditation. As of 2017, the year-end reporting deadline is the last business day in March for the previous calendar year. Providers accredited by a state medical society should verify due dates with their accreditor—submission deadlines may be earlier. Confirm or update contact information. Enter all activity and program summary data for the year through PARS. If your current LMS makes it difficult to view, compile, and analyze user data, then you should look for a CME management that offers LMS services and PARS submissions management. For a CE coordinator managing your CME program’s ACCME standards alignment efforts, using a PARS management solution—one that collects, formats, and submits compliance data would eliminate one of your most resource-intensive tasks. The ability to filter data by date and user demographics. Automated reporting to boards and other external systems, including ACCME PARS, CE Broker, and CPE Monitor, and more. Managing data collection and PARS submissions doesn’t have to be an overwhelming experience for your association. The EthosCE platform provides a robust, enterprise-class LMS with data management and PARS-compliant reporting as a standard feature. Want to learn more? Connect with us to find out how the EthosCE LMS can transform your association’s CME operations.